Any attempt to link the past of the Kurds in Iraq to their future depends on whether the president of the Kurdistan Region can cry. This is not to say that the president should not make speeches, as speeches are required of presidents today and the inability to cry is not synonymous with the inability to articulate. And who would want a president who never speaks? However, it is catastrophic that nowadays more care is taken in writing presidential speeches than in understanding the inability of a president to cry. Modern presidents have become reading machines, voicing written words that are assembled by non-presidents. The ability to cry signifies neither the absence of total silence, speech, or rationality nor the presence of a magnificent marker of aesthetics and emotionality. It is impossible to reduce crying to the status of an emotion opposed to rationality, just as it is impossible to equate justice with laws or with the modern state constitution. Crying is never hidden, just as acts of injustice can never be forgotten. If we can agree that crying represents an imminent call for justice, then crying can be considered irreducible to a natural state of inarticulation. Rather, crying demonstrates an act of decolonization of the self and the world, forming and proclaiming a decolonized and hospitable order. The inarguable historical “fact” is that in Kurdistan, a national constitution – let alone a system of law independent of politics extending beyond the paradox of colonial politics – has never existed. In the historiography of the region the Kurds’ presence have marked an absence because they have long been signified “blank.” The inability to cry therefore haunts the Kurdish president. It has now been a while since I returned. I know I am back. I start to take stock. My room of solace and solitude. It is my island, and I am all alone. My island and my aloneness resemble Robinson Crusoe’s, but my sense is exhaustingly shifting. I continue to be haunted by what I have witnessed, which I continue to carry in me. This chair is my chair. This is the desk where my books are, and these are my windows. But am I actually back? The books that I see on my shelves are ones I received as implausible gifts. Here is the book Les Damnés de la Terre (The Damned of the Earth) by Frantz Fanon. I have read this book many times. And I carry it with me wherever I travel. In Kurdistan, I looked in vain for a Kurdish translation. Because Fanon has yet to arrive in Kurdistan, people must read him indirectly. I open the book and notice a line drawn below every single sentence, on every single page of the book. This uninterrupted line serves to remind me not to forget what I had read so many times and to always remember that Frantz Fanon takes endless turns in human thinking. He insists that to be a human is to be neither a colonizer nor one colonized and to be always responsible for decolonizing one’s self, one’s space, and the world. He calls for a decolonized order as a new beginning. I always remember Frantz Fanon in order not to forget the universality of humanity on my own island. I know that I have inherited the words of Fanon. Words are formational, and he knew that. They create us as we enter into a relationship with them. We confirm our own subjectivity and we change the world when we begin speaking. The line I drew under the text in Fanon also is there to insist on my rereading every word in the book and to stress the importance of my remembering all those irredeemable losses that these words together recall and infinitely voice. This is a living principle on my island: to re-member, and to speak against, all acts of injustice and to struggle for a new beginning in my own every-day life. Unwavering, rare, hidden, and eternal interpretations appear dressed in certain words and constantly demand remembrance. I still recall that it was late at night when I first came in touch with Les Damnés de la Terre. Outside my closed windows, the moon was playing hide-and-seek among the swimming grey clouds as if it were a time of hunting for the moon. I even remember that I get goose bumps when I hold this book in my hands, with my eyes restlessly pursuing every word, taking in every thought entrenched in every word, hardly able to grasp the conditions of colonization and the acts of injustice under which Fanon’s words were given birth. The words have become Fanon now; this is how I re-member Fanon and how I carried Fanon with me to Kurdistan. I must recall that Kurdistan remains a world in translation – in infinite transition. For the last fifteen years of this twenty-first century everything in the north of Iraq has been marked as a zone of internal violence as well as by Iraqi state and imperial political brutalities. This violence continues to shape the everyday life of people of what has come to be known as the Kurdistan Region of Iraq. As a liminal designation, “the Kurds” had been perceived as “blank” and “uncivilized” villagers for many centuries, in the words of the British colonial surrogate, Winston Churchill. The Kurds, as we encounter them in the 1881 adventure story, Durchs wilde Kurdistan, of Karl May, mainly represented a kind of indiscriminate banality to the colonial powers, associated not only with tribalism and conflict between rival groups but also with bravery – as only good fighters. The swathes of land inhabited by the Kurds, rich in natural resources, had to be, and continue to need to be, controlled somehow. The Kurds repeatedly have been represented in a similar vein as May’s depiction of the noble Kurds: as good fighters who should be praised in order to be colonized and thus controlled. Anyone familiar with the political history of the Kurds will know that inconvenient political brutalities always have tended to replace and displace the Kurdish civilian’s pursuit of a dignified human life. The Kurdistan Regional Government at first appeared to signify a break from Kurdistan’s colonial history and a move towards another order, a new beginning. However, this romance has now been superseded by the problems of dealing with the past history of the Kurds, who first were in competition with each other and then with other countries in the region, such as Iran, Turkey, Saudi Arabia, and the remaining countries of the Middle East. The many worlds of the Middle East, including the Kurdish Region, have proceeded not only into the worlds of consumerism and the grounds for testing advanced modern science such as modern weapons but also into the world of colonization. The ordering principle of all these worlds has been to colonize the individual, the family, the roads, the village, the city, the library, the intellectual, and the sky. The future decolonization has yet to come. As a legitimate and necessary political body, the Kurdistan Regional Government seemed to mark a new beginning for Kurdistan. However, like all forms of political organization in Iraq, the government came to an end in 2014. The legitimate reign of the president of the Kurdistan Region, who had held office since June 14, 2005 and had extended his position by two more years, also came to an end. The second-largest political party, the Change List, invoked the two-term presidential law inscribed in the Constitution of the Kurdistan Regional Government and thus asked the president of the Region to step down when the additional two years had passed. This unexpected confrontation marked a turning point in Kurdish politics. Since the president has seen himself as the original heir of Kurdish politics and the main leader of the Kurdistan Democratic Party since 1979, the entire political situation has taken another turn. This began with the war against the “Islamic state”, which international media and the male-dominated local media in the Kurdistan Region turned into the only monster in Iraq and the Middle East, coupled with the politics of total financial collapse, resulting in the suspension not only of politics but also of the everyday life in the Region. This turn in Kurdish politics remains destructive, destroying the conditions for the possibility of a new beginning. The two most influential and phallocentric political parties – the Kurdistan Democratic Party and the Patriotic Union of Kurdistan – have gradually returned to the politics of colonization. The president has also shifted: he has now turned into an exceptional political necessity. He has to stay to fight political and economic wars and to fulfil his promise of Kurdish Statehood. 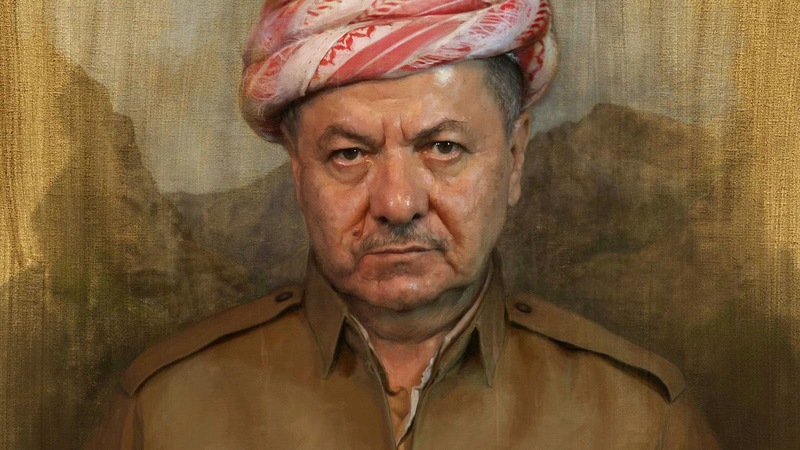 He is now the purveyor of the Kurdish state. What is more, the name Kurdistan Regional Government and the title president have now become the political domain in which the Kurdistan Democratic Party continues to operate and to expand its sphere of colonization. The Kurdish civilian population since 2014 has been reduced to de-symbolized bodies and clients of the two phallocentric political parties, with the civilians detachable at any time from their political status and human dignity. In other words, they have become Fanon’s damned/colonized bodies hovering between the colonizing powers of the two political parties which can exterminate and dehumanize with impunity, or make persons disappear or force them to wait indefinitely for their salaries. The Kurdish people are divided among different political parties but remain the workforce of the two main political parties. This is a living nightmare. I clearly remember how the political acts of the two parties have succeeded in translating and making repeatable the colonizing acts of the Iraqi Baʿth party. Baʿthism was a translation of the Nazi genocidal ideology and advanced through translation of the secret domestic surveillance apparatus of the German Democratic Republic. The Kurdish phallocentric political parties have learned how to control and to force almost the entire Kurdish population into the roles of silent and obedient subjects by dividing them and turning them into party members. Asking whether the president of the Kurdistan Regional Government can cry is equivalent to asking whether he can exist beyond the colonizing forces that guard his position. Therefore, the inability to cry cannot be seen as only another name for inarticulate politics but rather signifies the exceptional political necessity: in other words, the president himself. Talking about Kurdish politics and turning to the phallocentric political parties, Kurdish civilians repeatedly said to me: The parties are, in fact, like the Baʿth regime – they are the Baʿth regime. Their thinking is Baʿthist. They behave as Baʿthists would behave. They think of themselves as your rightful owner – you are made to see yourself as nothing but a naked body without any political or cultural significance. They would tell me that it appears natural for the two parties to preserve an intimate love of oppression and humiliation – that is, of colonization. Since the parties love only themselves, you can hardly be anyone but a worshiper to the extent that you promise to kill yourself at their feet if need be. As soon as you speak against the exceptional political necessity, you disappear or are dehumanized. As soon as you speak of political freedom in particular, armed agents claiming to be from one of the many Security Agencies unexpectedly will arrest you and dehumanize you. The colonized body is always a dehumanized body that is not allowed a voice or the right to speak. Sardasht Osmān and Kāwa Germyānī are the two names that some remember as voices of resistance in the Region. While Sardasht was kidnapped on May 3, 2010, and later murdered, Kāwa was murdered outside of his home on December 6, 2013. Sardasht criticized the president and the leader of the Kurdistan Democratic Party, and Kāwa promised to render public documentary evidence that would show how the Patriotic Union of Kurdistan abuses the wealth of the Kurdish people. The Kurdistan Democratic Party’s celebrated acts of colonization are also territorial. The Party declares its territory with its visible atmospheric violence, which also marks a return to the political border between the Kurdistan Democratic Party and the Patriotic Union of Kurdistan that was established during the war that lasted four years, from 1994 to 1998. The war is now remembered only marginally as “fratricidal.” Accountability for the exterminating acts of that fratricide remains to be rendered public in the Region. The current politics of the two parties continue to be premised on having colonized territories and on performing colonizing political actions that close off the future for the colonized bodies as a way of repeating the past as both the source of and the condition for political action. The act of humiliation that rendered Hêmn Abdullkhāleq a colonized body – that is, a de-symbolized body with no rights or dignity – audibly speaks to the elimination of critical voices in the everyday. It is a force of colonization in a world divided between those with the power to kill and the killable bodies. In addition, not only has the Kurdistan Democratic Party suspended the Kurdish Parliament as a national political body but the Constitution of the Federal Government of Iraq and that of the Kurdistan Regional Government also are not being followed and the Kurdistan Regional Government is not functioning legally. Furthermore, the Party also blocked the members of a democratically elected political party – the Change List – not only from legitimately entering the Parliament but also from legitimately entering the city of Erbil. The president of the Kurdish Parliament along with the Minister of Finance and other Ministers – all of them members of the Change List – were forced to leave their posts as well as the city of Erbil. These Change List officials had refused to extend the presidential term. The Kurdistan Democratic Party thus is now the only ruling political party in Erbil, which is the center of political gravity for the Kurds in Iraq. And as a world of colonization, the Kurdistan Democratic Party has assumed the power of an unwavering sovereign, as manifested by its arbitrary arrests and forced displacement. Anyone choosing to defy the political sovereignty of the Party is expelled beyond its territory. As it suspends the rights of the citizen and prevents democracy from entering Erbil, the Party reveals and reinstates itself. It has the power to silence whoever wants to speak of rights and dignity and explicitly forbids anyone to contest the exceptional political necessity – namely, the president. The suffering colonized body of the Kurdish nation has thus become dismembered. Its recent history of triumphant peace, political stability, and economic prosperity has been broken into pieces. The exceptional political necessity is introduced as a new beginning. Those subjects who remain are made to feel powerless, feeble, and economically dependent on the Kurdistan Democratic Party and the Patriotic Union of Kurdistan. The nation stands at the mercy of phallocentric political parties and explicit agents of fear and dehumanization. The nation resigns itself to begin believing in what Forough Farrokhzad viewed as the Dawn of the Cold Season. Why is the president unable to cry? Which stand as islands in a desert of death. Tens of thousands of restless feet. Wide-open eyes in search of a refuge. They are walking with their bare feet and with no particular place in mind. Every one of them speaks of a world in transition and of being forever displaced. I see the children sitting as if at the heart of an inferno, their white tents having been erected next to a road built by the Iraqi Baʿthist state. These roads to what have come to be known as “internally displaced camps” are landmarks of control and of global politics. The camps are nothing less than spaces of colonization. People contained in these colonial spaces have no rights but the right to wait for food. They are turned into naked bodies in need of food for survival, and the sites have become sites of global humanitarian intervention a current pretext for trading in oil, modern weapons, and political control. The Kurds are “brave fighters” and should be armed with one of modernity’s most annihilating gifts. The president claims and justifies his position by welcoming the recognition he receives as he continues to militarize the land and the families under the control of his party. Granted, nearly every political party in the world claims to be democratic, just as every person who is sexist and every racist insist on being called non-sexist and non-racist. But the current political situation in the Kurdistan Region is what especially brings to my mind The Damned of the Earth, which always allows itself to be read as The World of Colonization. We knew death would attack us. We were ready, standing unarmed before death. We are still fighting and will continue until the last breath of our life. And we did fight death. We really did until we faced the inescapable violence of the annihilating weapons. No one was there to defend our humanity. They left us. They left us [she said repeatedly]. They even took our ammunition, which we so desperately needed to continue the battle for our world. I mean our humanity. [She whispered] You cannot speak out loud about humanity because it is a threat to politics in this world. Yes, we asked them. But they took everything. They flew away like birds. She: They are called “Before Death” [pêshmerga]. They face death and have no fear of death. I: Why did they flee then? I: Hold on. Are not those who stayed behind are those who should be called before death, rather than those who fled instantly? I mean can we say pêshmerga even if they “flew away like birds”, as you say? She: No, no, they would never accept such reasoning. They cannot reason. But, we know that we are still Before Death. That is why we are fighting every day. Still, we are moving closer to social death every day. The male leader of the Kurdistan Islamic Group, a polygynist of one of the many phallocentric political parties in Kurdistan, rendered public his religious testimony, declaring the “big and black-winged bats” to be “martyrs – they are fighting for the cause of God.” In addition, the leader of another political party, the Kurdistan Islamic Movement, is said to have been the first to say that the “big and black winged bats are martyrs.” This is the gift of democracy. Iraq in its entirety has become a land of Islamic leaders and martyrs. Some Kurdish parliamentarians in what was once called the Parliament of the Kurdistan Regional Government acknowledged that there are Kurdish parliamentarians who have been trading oil and arms with the “big and black winged bats” since 2014. Moreover, the question of how the “big and black winged bats” have been able to secure sustainable political and economic relations with some countries in the region remains to be asked. Can the president cry? Is any president in the world able to cry? As I circulate on my island, I continue to hear the Êzîdî mother’s voice, repeating to me how women are fighting, articulating, remembering and writing the lives of colonized people inside the white inferno. As I turn around on my island, I catch sight of another book, The Divan. I had done the same, drawing a line under every single sentence in all of the pages that made up the book. The words constitute an attempt at decolonizing what continues to colonize the author’s entire world. The author’s name, Forough Farrokhzad, and her words remain lodged in the memory of many people worldwide. Unlike Fanon, her writing has been present already for some time in Kurdistan. I remember Forough Farrokhzad and Frantz Fanon crying within a sea of blood. I remember how the Êzîdî mother insisted on the importance of keeping close to our memories. We become memories as we carry our loved ones and the world. And memories, Forough insists, make our loved ones appear as Another Birth, surviving their death and ours. The president is yet to come as Another Birth. She is yet to come. The Êzîdîs who are crying and carrying their memories of loss and of lasting suffering call forth the idea of Justice as Another Birth. By their involvement with questions of Justice and history, they have started to move beyond mere descriptions to the lived experiences of social death. It is because of this inescapable history and of Êzîdî women’s powers that decolonize and call for another birth – in other words, their crying – that the president needs to spend much time on learning how to cry. To do so would mean to understand and learn to live with the Êzîdîs’ cries for Another Birth – a decolonized order. Of the restless feet and the wide-open eyes? But also for the Êzîdîs must be cried out. This awaits the president who is yet to come and the colonized bodies who are yet to speak, who will articulate the deadening silence that tries to erase what has occurred and what continues to take place and thus break open the acts of injustice, the past to the future, and the foreclosure on the world that is continuously colonized. -Fazil Moradi has conducted research at the University of Stellenbosch in South Africa in 2008, studying latent and manifest forms of racism, segregation and segregated spaces, racialized skin color, and other practices of exclusion to argue that the post-apartheid “rainbow nation” carries along a sustained racializing legacy of the apartheid state. Moradi has also carried out research on evidential testimony—acts of remembrance, memory making, museums and photographic archive—of genocide in Rwanda, and the first anthropological study of the Iraqi Baʿth state’s genocide (al-Anfāl operations, 1987–1991), focusing on modern state formation, bureaucracy and archive, evidence and memory, evidentiary institution and site, symbols of everyday mourning, justice, forgiveness, forgetting, and visual and aesthetic translation in the aftermath of genocide in the post-Baʿth Kurdistan Region of Iraq. Moradi is an associate at Max Planck Institute for Social Anthropology, and member of the Research Network, Law, Organization, Science and Technology, Martin Luther University Halle-Wittenberg. His recent publication is: “The force of writing in genocide: on sexual violence in al-Anfāl operations and beyond.” In Gender Violence in Peace and War: States of Complicity, edited by Victoria Sanford, Katerina Stefatos and Cecilia Salvi. New Brunswick: Rutgers University Press, 2016.